We’re rolling out new Technogym equipment throughout our gyms across the country. With our first few rollouts underway we caught up with some of our Personal Trainers in Sunbury Gym to find out what the investment and upgrades mean to them in their PT role with us. The floor is laid out into new zones created to help members experience the right level of training for their goals and progress when they are ready. While the Technogym equipment, has been specially selected because it offers a great, effective workout experience for all. Members will be able to experience new gym floor classes such as the new SKILL ATHLETICTM group training classes, and can track their progress and download workouts to their smartphone by utilising the new MyWellness fitness app. 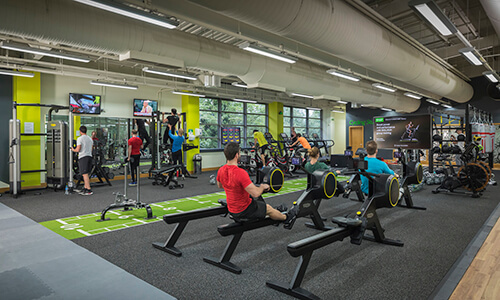 Take a virtual tour of our Sunbury Gym and the new Technogym equipment here. ‘I loved the watt bike and techno gym training. I will find the gym floor classes a new challenge to engage with members and help build my client base. The “how 2s” so far have gone really well, even when it’s quiet at the weekend – means I can have 1 or 2 people at a time to personalise their training goals. Existing clients love the new kit and it motivates them.’ – Louise Toms, Wellbeing Personal Trainer. ‘The new gym is groundbreaking, the zones are functional and fun and create a real buzz it has re-invigorated our client’s motivation. Members are showing interest in personal training to make the most out of the new equipment.’ – Emma Beany, Senior Wellbeing Personal Trainer. If you’re interested in applying for our Personal Trainer careers, please register your interest here.